Friend #1, whom I’ve known since the 5th grade though I hadn’t seen her since high school, has long enticed me with pictures of the Central Coast’s restaurant scene, where we both grew up. Excepting San Luis Obispo and steakhouses, the Central Coast has lagged in fine dining in the past, especially fine dining for anyone not dubbed a carnivore. Friend #1 is a pescatarian, and she’s wanted to show off good places in the area for likewise-minded eaters to dine for a while. So on a recent trip, I insisted she pick us a spot fulfilling that qualification so I could blog about it and encourage more to crop up. And thus, we ended up at Ember, a newish Arroyo Grande restaurant with definite big city aspersions—and big city prices. I loved the wood and stone exterior of the restaurant. The building fits right into a small retail strip with a bakery and a juice shop. The inside was cozy and low lit enough for a romantic date but lively enough between the open-air kitchen, bar, and plentiful seating to make it easy for friends to catch up. 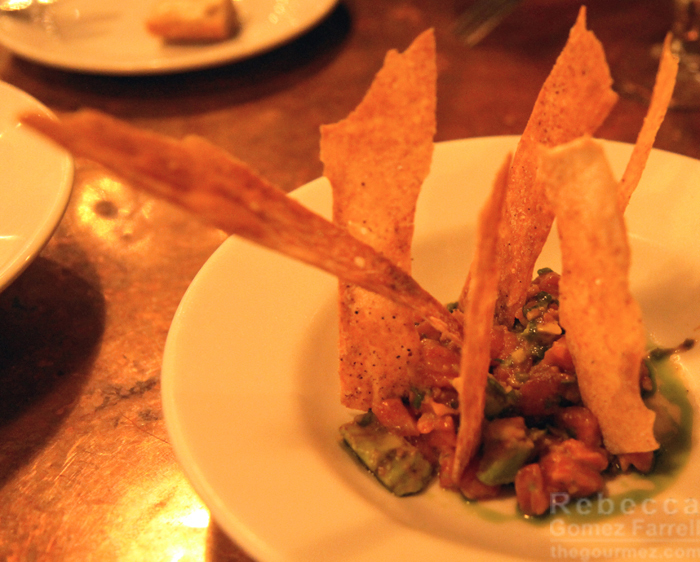 As is often the case, the appetizers and small plates drew my eye more than the entrees. Luckily, Friend #1 was in the same mood. 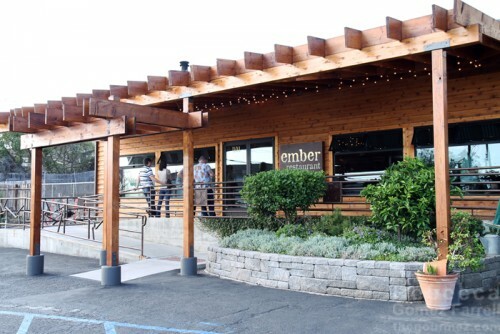 There are plenty of meat options on Ember’s menu, but there are also multiple vegetarian and seafood choices, which was why we headed there in the first place. The salmon poke went for an avant garde cracker presentation that made it a centerpiece. So did the flavors: avocado, ginger lime, and charred jalapeno. I love heat in my food, but the poke ventured on the horseradish side for the first few bites, which is too much heat for me. Yet that impression quickly faded—perhaps I needed to settle into it? The salmon had plenty of flavor, and its richness and that of the avocado chunks cut through the penetrating spice well. 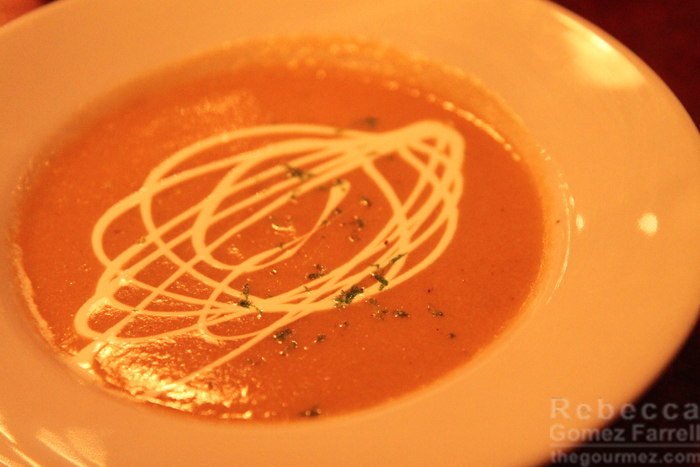 A corn bisque special with piquillo peppers was the only dish of the night that didn’t impress. It wasn’t bad by any means, just uniformly corn with only a slight hint of the peppers. I like ingredients that don’t disappear into each other, and this didn’t meet that measure. 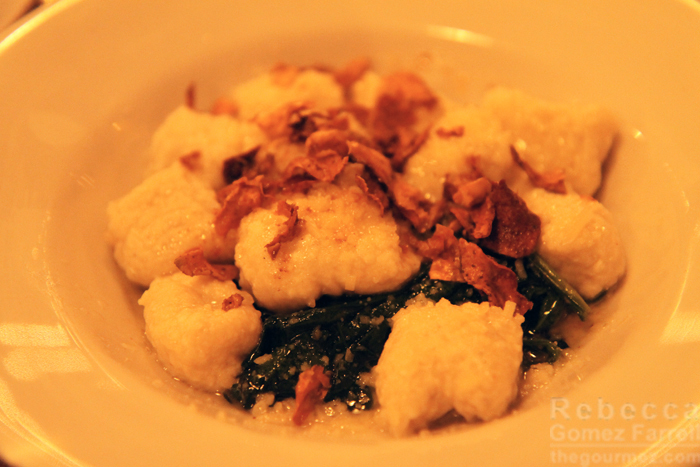 The ricotta gnocchi, however, was amazing. Luckily, Ember keeps a version of this dish on the menu with only seasonal tweaking. Gnocchi are often described as fluffy pillows. These pillows were enveloped in a silky pillowcase of tangy ricotta that made me revel in the joy of a good night’s sleep. The fried garlic chips on top provide an excellent textural counterpoint to the gnocchi. Flatbread pizzas are one of Ember’s signature dishes as they showcase their brick oven. We opted for one with zucchini and pesto sauce despite our lagging appetites. 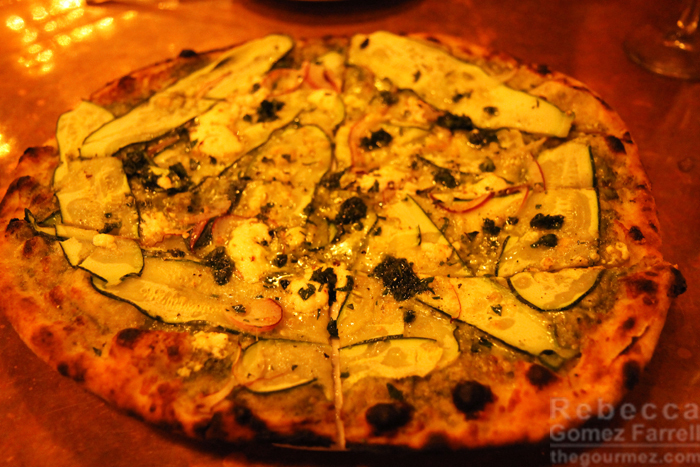 The crust’s outer rim was indeed excellent, but I found the pizza too floppy toward the middle—NY pizza lovers rejoice! This one’s for you. The freshness of the vegetables also shone. Zucchini lovers rejoice! This one’s for you, too. Over the past few years, I’ve been delighted to see more dining options crop up for Central Coast denizens. 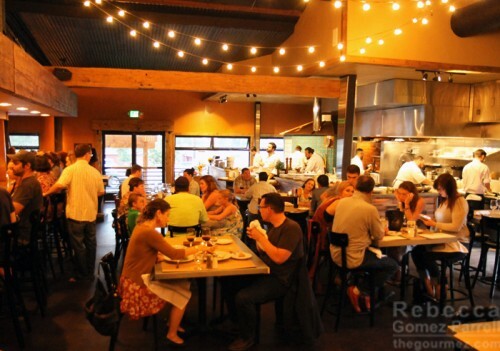 Ember is a quality addition to them that I’d visit again if only for those gnocchi. Luckily, the menu boasts enough tasty items that woman must not live on gnocchi alone.